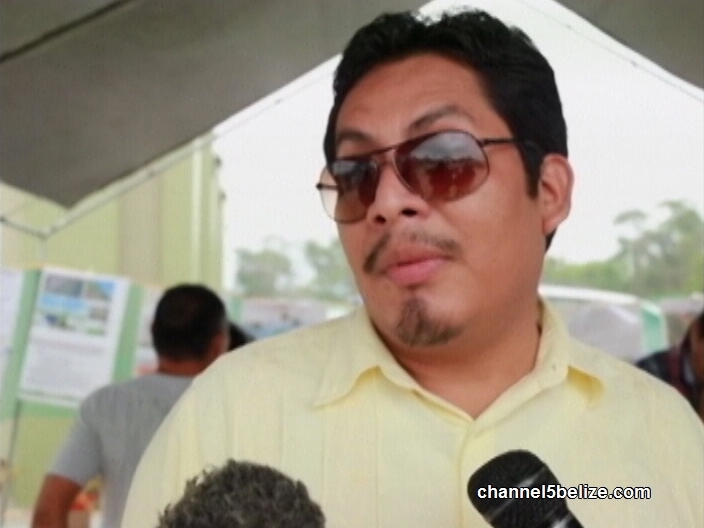 Prime Minister Dean Barrow has gone on the record to state that the Ministry of Natural Resources is a hotbed of corruption. He probably could have gone further to call it a hotbed of incompetence as well. 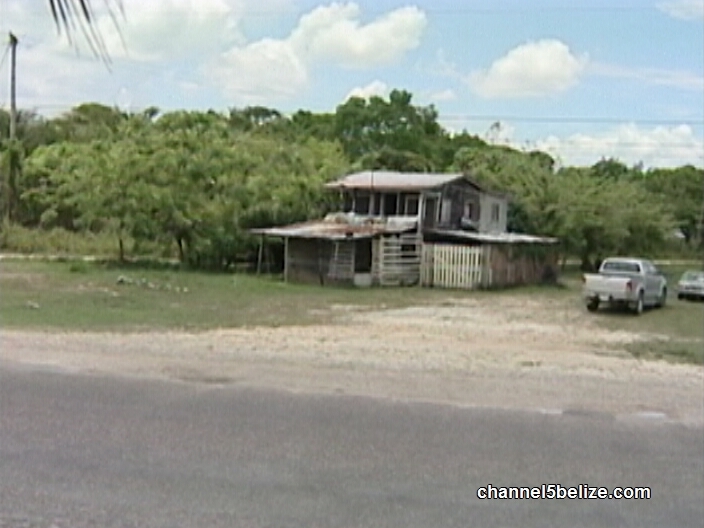 News Five has been covering a land dispute in Unitedville in the Cayo District since early May. 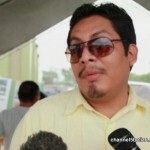 When the story first broke, both the Minister of Natural Resources Gaspar Vega and the Commissioner of Lands Wilbert Vallejos vowed to resolve the dispute. 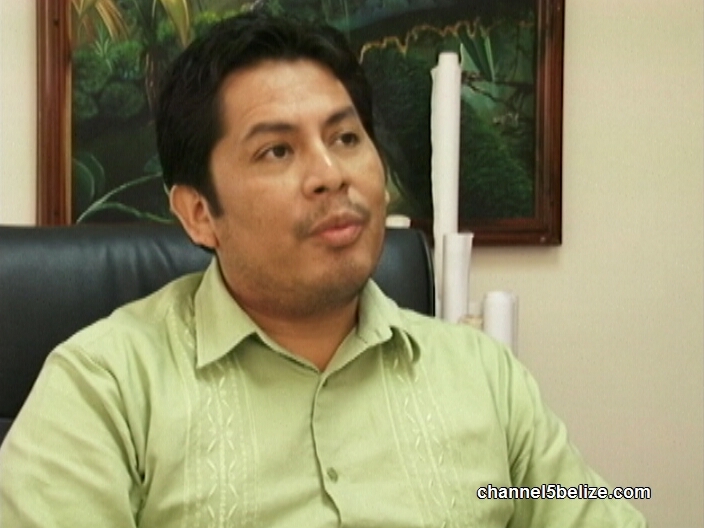 Commissioner Vallejos has since stated on the record that the dispute has been resolved. But five months after, it hasn’t, and nobody from the Ministry of Lands is saying a word. Mike Rudon was in Unitedville this week and has that story. 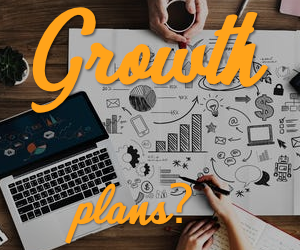 Let’s keep this story simple, because it is. In 1992 G.O.B. acquired a piece of land in Unitedville for a water reservoir for the community. That was built and life went on. Some years after, 2010 to be exact, Beverly Fischer, who claimed to be the person entitled to get compensation for the acquired land, wrote G.O.B. demanding it. 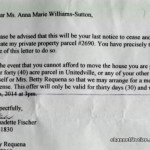 That led to this – a transfer document signed by Minister of Lands Gaspar Vega, granting Fischer title to parcel 2690 in Unitedville as compensation. The only thing is that parcel 2690, approximately five acres, was already surveyed and occupied, even before 2000. That’s the story we broke in May – as persons occupying the five acres raised hell because Fischer was telling them they had to leave. Our story caught the attention of the officials at Lands, and on May nineteenth there was comment from Commissioner Wilbert Vallejos. But that wasn’t exactly true. 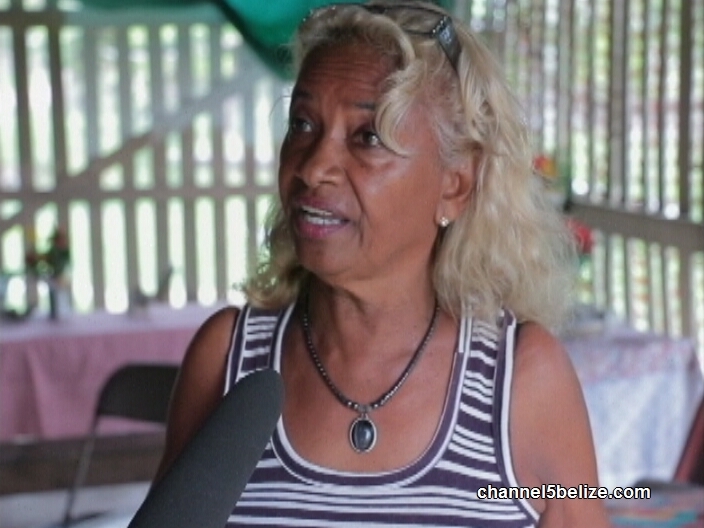 News Five has gotten copies of vouchers paid to Bernadette Fischer in 2011. On May twenty-sixth, she received five thousand dollars as part payment towards land acquisition. On June fourteenth, Fischer received thirty thousand as part payment towards land acquisition, and on July eighteenth, Fischer received twenty-five thousand as final payment for land acquisition – a total of sixty thousand dollars. Now fast forward to August twentieth, 2014. And then fast-forward to today. 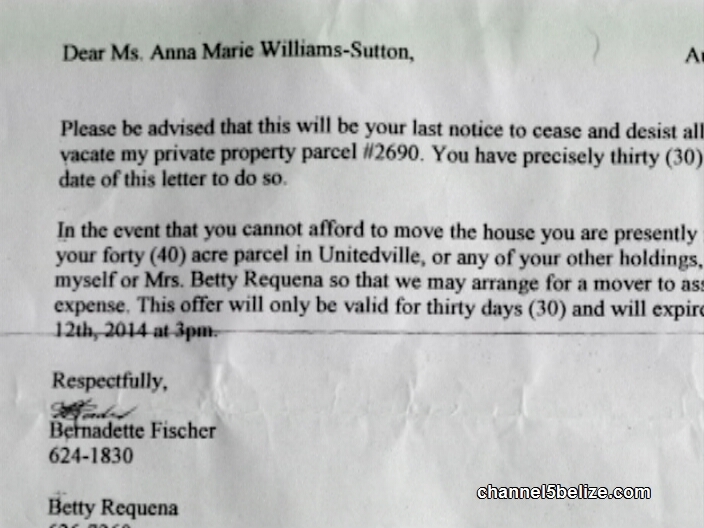 Sutton has received an eviction notice from Bernadette Fischer which gave her until September twelfth to leave. She didn’t, but says that Fischer is now trying other ways to get her off. 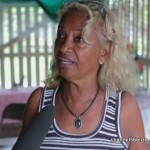 According to Sutton, she and other residents have tried without success to reach Commissioner of Lands Wilbert Vallejos. We know the feeling. The one time I did get him to respond to a text on Wednesday, he refused to comment on this particular matter. Sutton and the other residents don’t know what will happen next. They don’t know if they will be forced to leave. They don’t know the status of their parcels of land. And right now, there is nobody in the Ministry of Lands who is willing to provide any answers, or comfort. Mike Rudon for News Five. what is a “Vietnam license”?